Are you ready to learn more about denim fabric, garments, & fit? 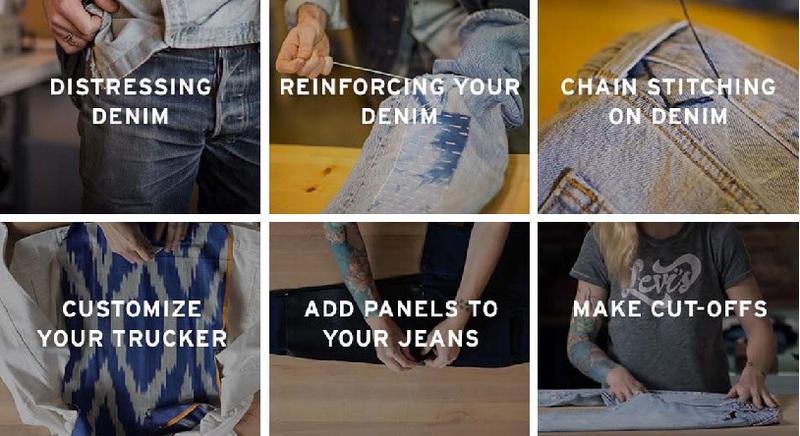 Levi's guide to Denim is your dream come true. Fabric weight is the measure of ounces per square yard of fabric. Denim is typically woven in weights ranging from 4 to 15 ounces. Any treatment to jeans after they’ve been cut, sewn and washed to give them a desired surface effect. Common finishes are whiskering, fraying and embroidery. Denim woven with uneven yarns in both the warp and weft, creating a unique, gridlike finish. Also known as “sanforized,” preshrunk denim is treated to prevent shrinking after washing and drying. Preshrunk denim first became available in the ‘60s—before that, all denim was Shrink-to-Fit™ Fabric. Elastane is a synthetic elastic material made of polyurethane, used to add stretch and recovery to clothing. Levi’s® denim is made with varying amounts of elastane, depending on the level of stretchiness desired. A sewing technique in which a series of looped stitches form a chain-like pattern. Chain stitching can be used in embroidery to “draw” illustrations on fabric. The acid wash process involves washing denim with bleach-soaked stones for a marbled finish. Above is simply a tiny tease of the information that you can find in the Denim Dictionary by Levi's. Thank you for taking the time to read our denim fashion education blog post. We hope that you have found this news to be informative. You may also want to visit the Apparel Search glossary if you would like to learn about other fashion relevant definitions. You can visit our apparel glossary or if you wish to read more lengthy definitions, you can try our fashion terms section for additional reading. You can learn about repairing your jeans, adding panels, distressing denim, tapering jeans, and more from The Levi's Tailor Shop. If you need help from a pro, you can ask Levi's about one of the Tailor shops near you (note: they have a limited number of locations).